We seem to be in a kind of renaissance period for platforming games. 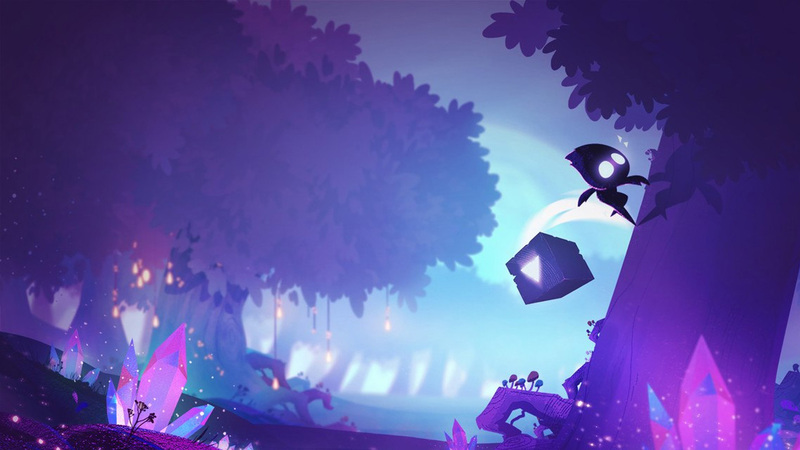 For so long we had few and far between, now with the rising popularity of the Switch and more developers emerging on the indie scene, we’re seeing more and more games that take on the vintage mantle of platformer. However, they are a different breed now. The base species can still be identified, but what we know as a platform game has evolved. Since the release of Super Meat Boy we’ve seen a rise in twitch or precision based platformers; the recent release of Celeste can attest to the want from players for something with stark difficulty as well as traditional platforming aspects, intermingled with a high level of control. Light Fall, has travelled the same road and brings all of that in spades, but does so with a dreamlike shine in visual fidelity. It’s these visuals that are the first to impress when loading Light Fall for the first time. The story scenes are rich in painterly qualities that evoke a sense of wonder and awe. Our mysterious protagonist is reminiscent of the boy from Limbo – made from shadows, with only pinpricks of light for eyes, he allows the player to overlay his form with their own ideas of style. The brilliance is that this style is transposed wonderfully into movement, because he moves like a shadow. He’s fleeting, almost opaque and his jumps and sprinting are fluid. Simply holding the right shoulder trigger will launch him into a run that courses with energy and hitting jump, he cuts through the air like a child from the boughs of a tree. He emulates carefree abandon, which is fitting for the world he inhabits. It is worth noting from video and screenshots, that he is tiny on the screen, especially when playing in handheld mode. He may be a little too small, if I were to nitpick, but it does help give a sense of grand exploration. As if jumping from the dark recesses of a Disney imagination, Light Fall takes place in the days after disaster. A people vanished, their Gods worshipped but ultimately helpless. Guiding our adventurer is an owl who verges more on spirit guide than companion – filling in story points or describing the world as it used to be. This perfectly accompanies the lore which is found within crystals scattered throughout levels and read in a central hub or at checkpoints which also keep memory of your progress. Should you want a rich story, there is one here, but if you’re here for frantic, energetic mechanics, you can slide the text to one side and focus on scaling the world. At times, the world can be a little sparse which is likely a design choice, given the setting, but it does sometimes cause the game to feel a little too empty. This is heightened when obstacles are brought to the fore and you ultimately realise you miss them when they aren’t there. Light Fall operates like any other precision platformer, using wall jumps and varying speeds to ensure safe landing. However, the concept that separates this from so many others is that our hero can conjure solid blocks from thin air. He does this with the tap of a button and can hold the block in front of him to block lasers, or place them beneath him mid-jump in order to scale higher heights. It’s an intuitive system that, once embedded into muscle memory, becomes second nature. You could use it to move vertically, or dash through the air pausing for microseconds on these blocks before leaping into the air again, making large gaps seem insignificant. There’s a catch, because of course there’s a catch. You can only place a block four times before you need to touch down on solid ground. This recharges the four uses, meaning juggling wall jumps, landing on platforms and climbing the blocks becomes a task in itself. Get it right and it feels wonderful, get it wrong and you can fall to your death. There’s also the ability to project a block forwards like a punch, which helps break walls and discover secret areas (of which there are plenty). It has more uses than originally intended and finding out this, while experimenting is all part of the game’s charm. Light Fall consists mostly of action, with minor stops for story with rich voice acting and sound design. There are boss fights and it should be mentioned that the developer, as of writing this review, is currently patching the final boss after feedback from the community. I’m personally waiting for the update because the difficulty spikes drastically – it’s not so much a steep climb as a vertical precipice. It’s clear the developer cares about the community that will envelop this game. They’re listening to early adopters, plus they’re inclusive of speedrunners – implementing time trackers and leaderboards for both Any% runs and 100% runs. It’s clear that once this game is adopted by players, it will be one to test swathes while keeping them entertained and in awe of what occurs on screen. If you aren’t going to speedrun or discover the secrets hidden away, the game won’t last long, but I still urge you to buy it, explore it and test yourself on some of the harder elements to be found.